In the morning traffic she rode along sipping a chocolate milk. 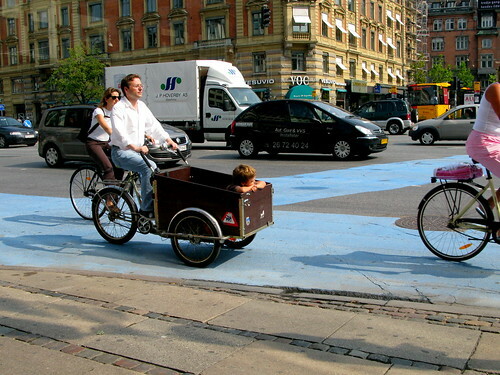 There is nothing quite so wonderful to see as cyclists who feel secure on the bike lanes of Copenhagen. 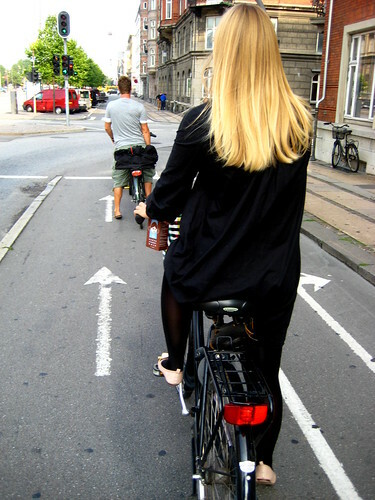 Indeed, a majority of Copenhageners say, when polled, that they feel safe in the traffic on their bikes. Our mate Nikolas, in Washington D.C. sent us this story from the local news. The management at the city's Union Station removed a woman's bicycle because it was ugly and they thought it was abandoned. Here's the link - watch the video on the right column. Nikolas asked if our authorities have ever confiscated a working bicycle just because it was ugly and rusty. Firstly, well over half the bikes in Copenhagen are ugly and rusty. They are mere workhorses. Nobody would dream of removing it for this reason. With that said, there are thousands of bikes that are gathered up each year, but not unless they are absolutley sure they are abandoned. Rusty, clunky old bikes are the standard here. 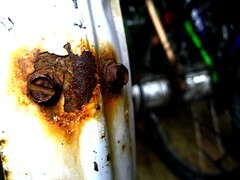 There is something aesthetically pleasing about rusty old bikes. Indeed, if you forgot your bike somewhere, you can count on nature taking it back. Nikolas said, "This begs the question, can one be Cycle Chic with an ugly bicycle?" Absolutely, we say. We have earlier tracked a Copenhagen trend concering old bikes. For some reason, women who wear shoes by Louboutin often ride an old, beat up Raleigh. These old bikes are an integral part of our bike culture and they're not going away anytime soon. great photos. just curious, what is the chocolate milk brand? it's the one with the little girl, right? The difference, of course, is that because Copenhagen seems to generally have classy, practical sorts of bicycles on the streets, your junkers just end up looking sort of charmingly antique. An old rusty American bike is usually a mountain bike from Wal-Mart (and let's be honest, there's really nothing aesthetically pleasing about that). ohhh the history is curious, even when the politicians decorate our cities with uglys statues, uglys buildings and uglys taxes!!! good point, raquel! they don't ask us if we like the statues/monuments etc, before putting them up, either. There is a post about the "ugly" bike that was confiscated in Washington DC at http://bicyclespokesman.com/an-ugly-bicycle/ That post was responsible for getting the incident on the television news. There should be a sign on the rack. Pretty bikes only! Just to be fair, they should take the liberty to confiscate any unsightly cars from the public space as well. Your car is ugly sir. That's all the excuse we needed!